For today's article I've decided to take a look on average hotel price in Bulgaria's Plovdiv and also list TOP 10 hotels there based on Booking.com recommendations. Now, just recently I booked my first flight to Sofia (capital of Bulgaria), after that I made some "investigation" what to expect in Bulgaria and crafted an article: Planing a Trip to Bulgaria - Hotels, Car Rental, Things to Do, Places to visit and Let's Buy a House There. In that article I talking about many topics, but one of the first I'm looking to have a nice hotel room both in Sofia and Plovdiv (hopefully with a nice view). In this article I have listed TOP 10 Plovdiv hotels, based on Booking.com recommendations in Plovdiv. Boutique Hotel Evmolpia is set in a traditional Bulgarian Rennaissance house in the heart of Plovdiv Old Town, and just a 2-minute walk from Kapana District. Guests can enjoy the on-site bar, as well as some free wine and the cheese bar. The rooms are furnished with authentic antique beds and wardrobes and have a flat-screen TV with satellite channels. Certain rooms feature a seating area where you can relax. You will find a kettle in the room. All rooms are equipped with a private bathroom. For your comfort, you will find free toiletries and a hairdryer. Evmolpia Hotel features free WiFi throughout the property. You will find a 24-hour front desk at the property. The hotel also offers car hire. Roman Theatre Plovdiv is 600 m from Evmolpia Hotel, while International Fair Plovdiv is 900 m from the property. Free parking is provided. Hotel Ego is a newly built hotel furnished to the highest standards, situated in the centre of Plovdiv in the immediate vicinity of the main street and the old town. The International Fairground and the train station are only a 10-minute drive or a 15-minute walk away, and the historic centre can be easily reached in just a few minutes. Most rooms are situated on higher floors to provide a quiet stay. In addition, the hotel also features a Finnish sauna, a hairdresser and a dentist, as well as a conference hall with multimedia equipment that can accommodate 25 to 30 people. 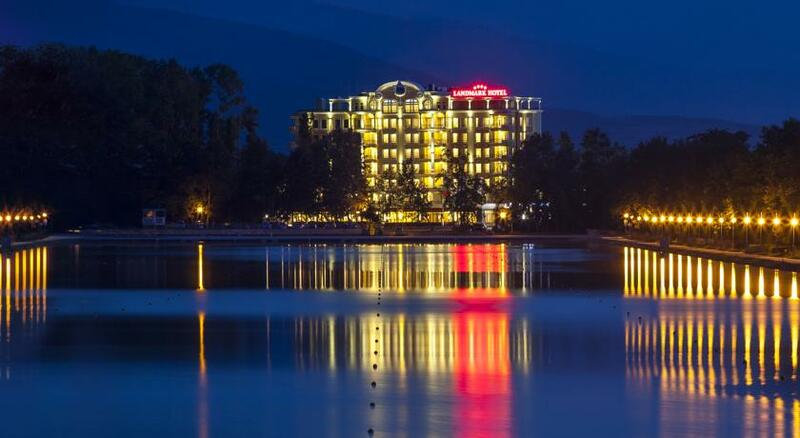 Located in the Park of the Rowing Channel in Plovdiv, Landmark Creek Hotel & Spa features a free outdoor pool, a free fitness centre, as well as a spa and wellness centre, including a sauna, for a surcharge. All of the rooms are air conditioned and feature free WiFi. A flat-screen TV with cable channels and a minibar are offered in each of the rooms. There is also a seating area. A balcony is available as well. The en-suite bathroom comes with a shower, free toiletries and a hairdryer. The rooms open to mountain or creek views. At guests' disposal, there is a restaurant with a summer garden on site. Services at a surcharge, offered at the Landmark Creek Hotel & Spa include shuttle transfers and car hire. Massages are offered upon request. The centre of Plovidv and the Old Town can be reached in a 7-minute drive. The building of the International Fair of Plovdiv can be found 6.5 km away. Plovdiv Airport is located 23 km away. 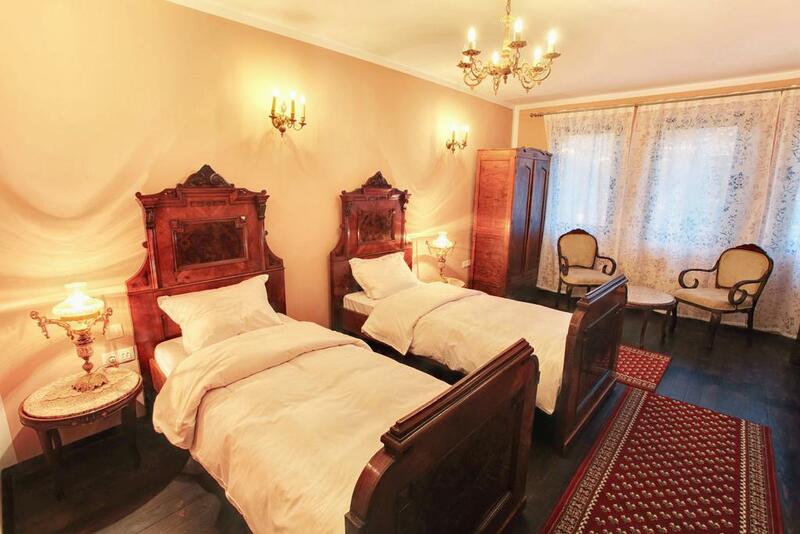 Situated in the heart of Plovdiv’s Old Town, the elegant Hebros is housed in a 200-year old Renaissance building. It features lavish interiors, an award-winning restaurant, and a sauna. The rustic patio is ideal for outdoor dining. 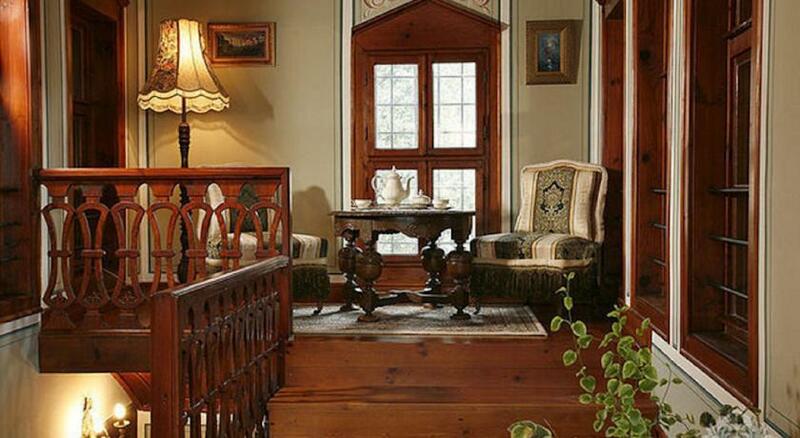 Hotel Residence Hebros offers luxurious guest rooms complete with antique furniture. The modern amenities include free Wi-Fi and a flat-screen TV. Some rooms have a claw-foot bathtub in the bedroom. The restaurant serves Bulgarian gourmet dishes and international cuisine. The extensive wine list includes over 400 labels, and the restaurant’s sommeliers can recommend suitable wines for each meal. The closest bus stop lies 150 m from the hotel, while the train station is 2 km away. 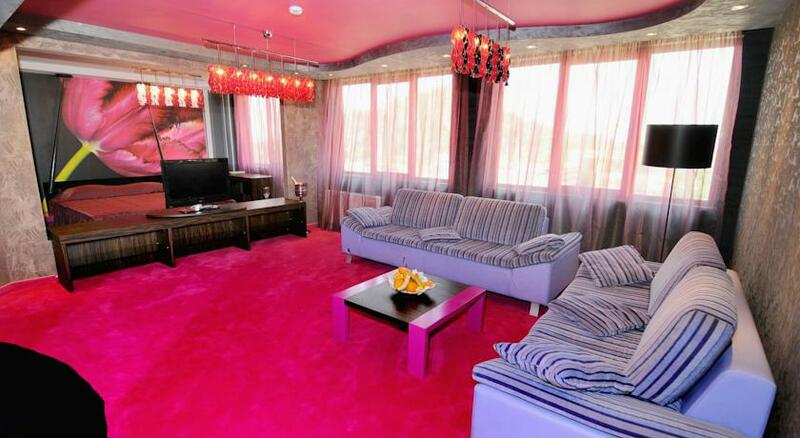 A popular local attractions is the Balabanov House, just 50 m away. The reception can arrange a pick-up at Plovdiv Airport, 20 km, or Sofia Airport, 120 km away. Located in the city centre, Ramada Plovdiv Trimontium is 15 km away from Plovdiv Charter Airport and 500 m from the bus station. 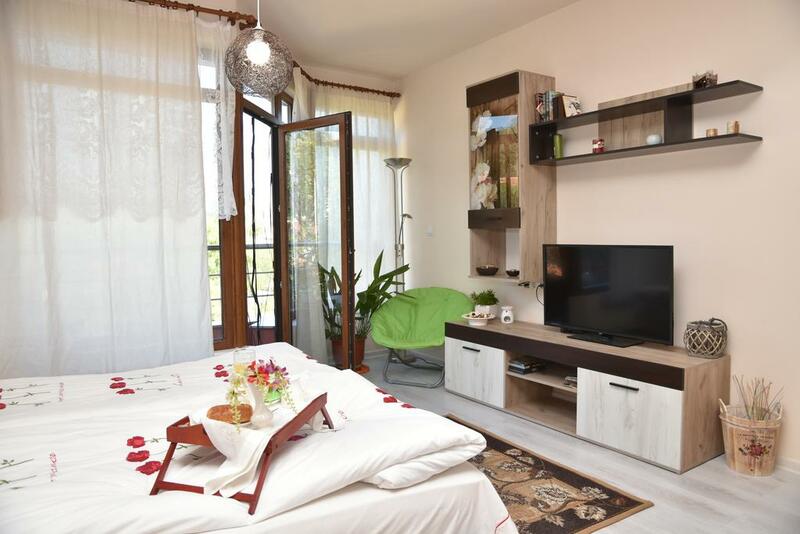 The property enjoys an ideal location near the main shopping and business district as well as the old town of this second largest Bulgarian city. It is also next to city garden, with beautiful green scenery and a pleasant, calming atmosphere. 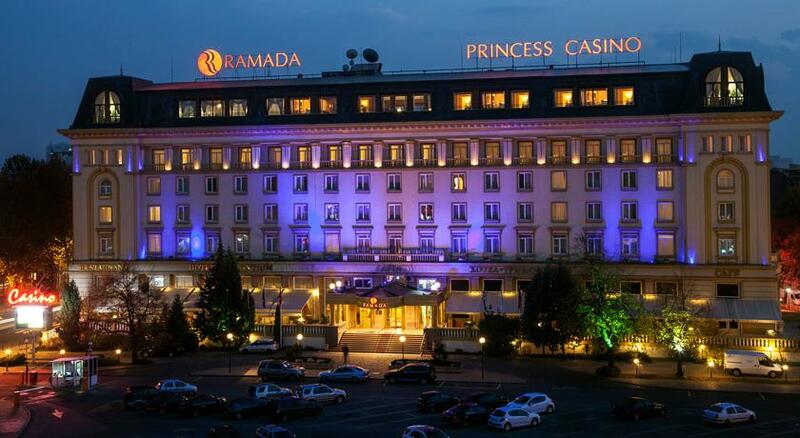 Ramada Plovdiv Trimontium faces the ancient amphitheatre and it is close to the railway station. 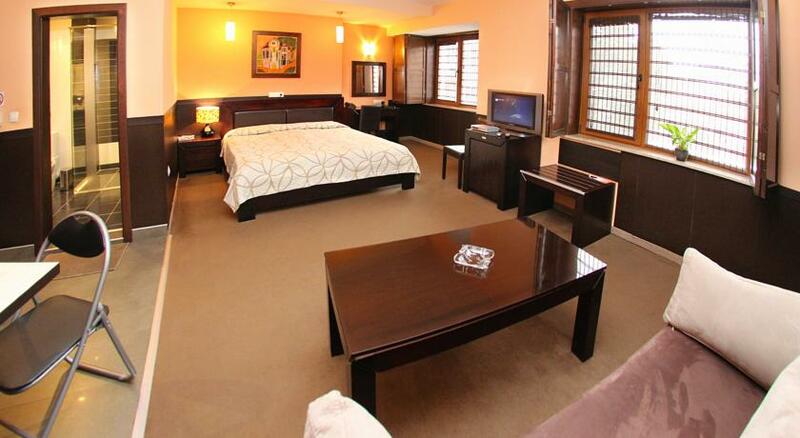 The elegant rooms with state-of-the-art equipment and a free internet access add to your comfortable stay. The hotel offers diverse restaurants and bars as well as many great facilities, including swimming pools, a beauty salon, a sauna, a fitness centre and massage services. Situated at the heart of Plovdiv, on the side of river Maritsa, Grand Hotel Plovdiv looks out towards Plovdiv Old Town and the picturesque Rhodope Mountains. The International Fair is a 5-minute walk away, while Plovdiv's Old Town is a 15-minute walk away. The spacious, contemporarily designed rooms offer any possible comfort and all those who have to keep in touch can enjoy the convenience of the free Wi-Fi in the entire hotel. Grand Hotel Plovdiv houses 3 different restaurants, a café and 2 bars, where you can taste delicious delicious local and international meals from the à la carte menu in a friendly and stylish setting. The hotel also offers at a surcharge a heated indoor swimming pool, hot tub, sauna, steam bath, hair studio, fitness and relax center with a variety of massages. Facilities include 8 conference halls, with different hosting capacity. Hotel Leipzig boasts a central location at the foot of one of the Seven Hills of Plovdiv, offering sophisticated and state-of-the-art interior with impeccable services. The biggest mall in the city is only 30 m away. Set within the centre of the administrative, business and commercial area of the city, Hotel Leipzig is 650 m from the Central Railway Station. The stylish accommodation units feature individual decorations and modern amenities. Plovdiv International Fair is a 10-minute drive away. 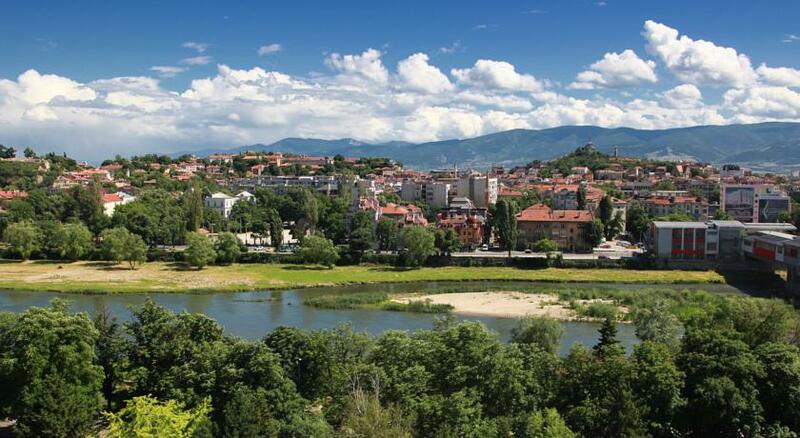 The Ancient Plovdiv, the historical, well-preserved part of the city, is also nearby. Located in the centre of Plovdiv, 600 m from the Roman Theatre, Old Plovdiv House in Kapana Area offers air-conditioned accommodations with free access to a sauna, a Turkish bath and a fitness centre. Complimentary WiFi is available in all areas. The units come with flat-screen cable TVs and each features a private bathroom with a shower. The apartments enjoy private terraces with city views and come with well-appointed kitchens. Guests of Old Plovdiv House in Kapana Area can enjoy traditional Bulgarian dishes in the on-site restaurant, which is set in a historic building. Further dining and shopping options are available in the surroundings and the Plovdiv old town can be reached in a 3-minute walk. Private parking is available on site, at a surcharge. The guest house is 700 m from the International Fair and 14 km from the Plovdiv Airport. Alliance Hotel is situated in the centre of Plovdiv, only a 3-minute walk from the Railway Station and a 10-minute drive from the Plovdiv International Fair. It offers spacious, air-conditioned rooms and free secured underground parking. All of the rooms, bathrooms and restaurants were renovated in November 2010, adding a modern touch to the Alliance. The old town of Plovdiv is just a 15-minute walk from the hotel. You can visit the Roman Stadium and the ancient Roman Theatre, which is still active as a cultural centre. The air-conditioned restaurant Kopcheto serves international cuisine and local dishes. The restaurant is equipped with a fireplace. It also has professional DJ-equipment and a large TV screen. Private transfers from/to Sofia and Plovdiv Airports, are provided upon request at surcharge. 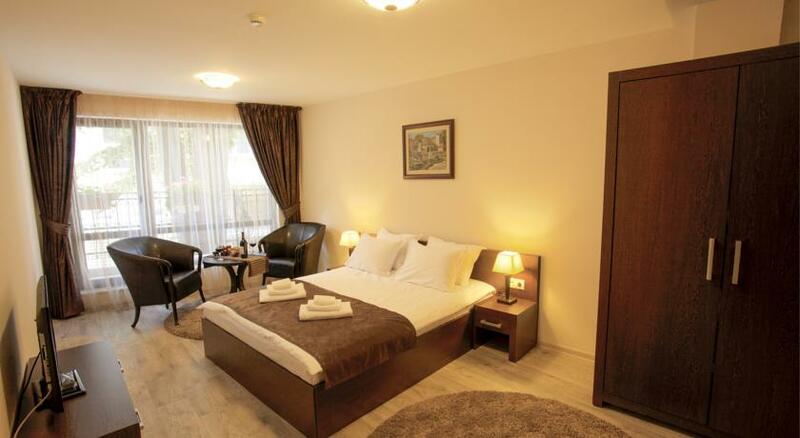 Featuring air conditioning, Plovdiv Apartments are situated in Plovdiv, 900 m from International Fair Plovdiv. Roman Theatre Plovdiv is 900 m away. Free private parking is available and the building has a lift. Free WiFi is also provided. The accommodation is fitted with a flat-screen TV with a variety of international channels. All units have a dining area, a terrace with panoramic views of the city, a kitchenette filled with a stove, a toaster, an electric kettle and a fridge. Mosquito nets and anti mosquito devices are available. Some units have a washing machine and devices for preparing healthy food. There is a private bathroom with towels, slippers, a hairdryer and free toiletries in each unit. Towels and bed linen are provided. Continental breakfast and packed food are available upon request. An iron and storage are featured and all beds are equipped with anti allergy, ergonomic mattresses and pillows. There are chess,backgammon, cards, dominoes, mikado and other games on site. Upon request and at a surcharge the property can also arrange car hire, bike hire, horse riding, shuttle services, massage services, cosmetic services, hairdressing, DVD, computer.